The question Christian Puglisi hates being asked most by journalists is “What is this ‘new Nordic cuisine’?” He tells me this at the end of our interview, he was so pleased I hadn’t asked. It is good, he said to talk to someone who knows about food. And although with me, flattery will of course get you absolutely everywhere, I had to say, eh, now that you mention it Christian, what do you think this “new Nordic cuisine” is? Without the slightest hint of irritation, he replied “The ‘New Nordic Cuisine’ is really a part of the past.” He was referring to an approach to cooking that advocates the use of seasonal, local and natural ingredients. 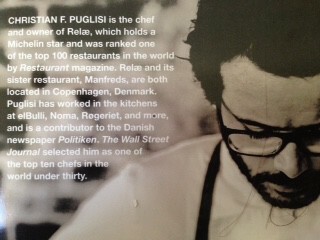 A former sous chef in Noma, which has been named the “World’s Best Restaurant” for four out of the past five years, Puglisi was the first of the Noma alumni to strike out on his own when he opened Relae in Copenhagen five years ago. He was rewarded with a Michelin star in 2012, and in 2013 Relae became the first fully certified organic restaurant in the world to hold the coveted star. It is currently ranked at number 53 on the World’s Best Restaurants list. “I think the future is definitely in other directions,” he says. “For me, the Nordic dogma is a little bit weird because it is a dogma that has existed in every cuisine everywhere else in the world. Cook locally, really? That’s not new. It’s very simple, but in terms of the fine dining scene, what I find more interesting than new Nordic, are the more global and ethnic influences. I think that’s going to be the idea of the future, to think globally and cook locally. Half-Italian and half-Norwegian, Puglisi, who was born in Sicily but moved to Denmark when he was eight, has been strongly associated with the New Nordic movement. When he opened Relae in 2010, Rene Redzepi, the chef behind Noma who is credited with starting the movement, gave him his full support and the restaurant was full from day one. Media types and travelling gastronomes were eager to taste this new approach to cuisine, which he was serving in exceptionally casual surroundings in what was considered to be a no-go, drugs ridden part of Copenhagen. The four course menu was priced at 325 Krone, (approximately €44) and for Puglisi, it was all about making fine dining more democratic and accessible to those who would not normally be able to afford to eat at this level. He brought the average age of the diner down 20 years, with students sitting side by side with Michelin regulars. And he consciously took a different approach to Noma – there was no focus on foraging or exaggerated use of herbs, and his plating was devoid of swooshes and all about subtlety. And rather than be constrained by the limitations of a Danish-only pantry as Redzepi is, he incorporated Italian ingredients like olive oil, citrics and anchovies. In order to deliver this level of cooking at a competitive price, service was cut to a minimum and diners could find their cutlery and napkins in a drawer at the table. With increasing demand for tables at Relae, he opened Manfreds, a more casual wine bar and restaurant across the road; and last year saw him delve more deeply into his Italian heritage, when he opened Baest, a restaurant he describes as being authentic with an Italian accent, as opposed to an authentic Italian restaurant. Moving away from the focus on vegetables he has in Relae and Manfreds, here he uses a wood burning oven to cook pizza and grill meat, particularly pork. Always immersive in what he does, his vision was to embrace the traditional craft of producing Italian products in his Danish environment. He travelled to Italy to try and learn the craft of making mozzarella first hand, but found that people were reluctant to part with the secrets to their family recipes which had been passed down over generations. Mozzarella, better imported from Italy or a hybrid made locally? Puglisi also spent time developing a process for producing authentic Italian style charcuterie in Denmark, where he says the process for charcuterie is industrialised with a fermentation and processing time of a week. “The charcuterie we do, which is salting and curing for longer periods without necessarily any smoke, and a longer fermentation, can take anything between two and five months. That’s a more Mediterranean approach,” he says. Q. Working with Ferran Adria in elBulli, “sorting peas in numerous sizes – then blanching”, what did you learn from your experience there? A. It was a great experience. I only knew the French style of cooking before I started at elBulli so it was an eye opener to see so many new ways to do something. Creativity was so important and it was an invaluable experience to me. Q. What is the most valuable thing you have learned from your training in other chefs’ kitchens? Q. What chefs inspire you? A. I won’t name anyone in particular but I really admire chefs who work hard and have the guts to bring personality and creativity to what they do. Q.What makes a great chef? A. It’s very, very complex work. There are lots of dimensions to a chef, you must work creatively and have passion for what you do but you must also be able to work with people, you have no kitchen without a team. A great chef needs to be able to motivate his or her team to move in the direction in when he or she wants them to go. A. Noma is obviously someplace that is very important to me and someplace that I am very proud of from the days of working there and also just having it in Copenhagen. Fäviken in Sweden is another favourite, it’s quite a dedicated experience as you must travel to get there but it’s so worth it for the produce-focused approach to their food. Q. What is the most incredible meal you ate in a top end restaurant? A. I have to say it was in Noma. When I was in elBulli it was the centre of the food universe. When I worked as a Sous Chef in Noma it was just getting established and wasn’t famous. After I left Noma I returned a few months later for dinner and it was the most incredible meal – Noma really had taken over from elBulli! Q. What is the most incredible meal you ate in an affordable restaurant? A. More often than not I have really great meals in affordable restaurants. Rumi in Melbourne stands out as a favourite. It’s a Lebanese place, really affordable and the food was great. Q. What do you think are going to be the next big things in food and restaurants? A. I think we are going to see more and more ethnic food – using really great local produce to create ethnic dishes, for example Mexican restaurants with high quality dishes but served in a more traditional casual setting. Q. What food trend would you like to see disappear? A. I’d like to see less story telling in food – intellectualising food. Food is very talked about and sometimes overthought. A little bit of instinct would be nice!